So many places to stay in Connecticut! There’s so much to do in Connecticut, you really need an overnight break to catch your breath. Luckily, Connecticut has lots of places to stay over in style, from cozy country inns to luxury resorts. Splurge on a beach house rental or spend the night in a campground at an amusement park! And if you’re bringing a group, you’re sure to find lodging in Connecticut to please the whole gang, with dining, spas, shopping, golf and other attractions always nearby. Dock your boat or stay close to the water for easy access to Connecticut fishing and sailing adventures with a variety of marina properties. Whether you like sleepy towns or vibrant cities, you’ll find a variety of motels in Connecticut that cater to road trippers. With two of the world’s leading casino destinations to top-rated spas and unique luxury resorts, Connecticut offers all kinds of ways to unplug and recharge. 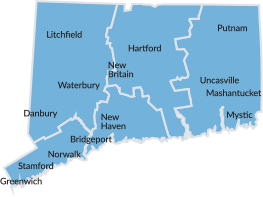 Find a rental property that gives you the comforts of home close to all the great attractions and activities Connecticut has to offer.